Aging: The skin around your eyes is delicate and thin and as you age, the skin becomes thinner which causes dark circles. Unhealthy Habits: Excessive smoking and consumption of alcohol makes your blood vessels appear more prominent which causes dark circles. Nutritional Deficiency: If your daily diet lacks the essential vitamins and nutrients, you are likely to have dark circles. Fatigue and lack of sleep: Inadequate sleep often results in dark circles under the eyes. Do ensure that you get a minimum of 8 hours of sleep. Not Removing Eye Makeup: If you love eye makeup, ensure that you get rid of it before you sleep. 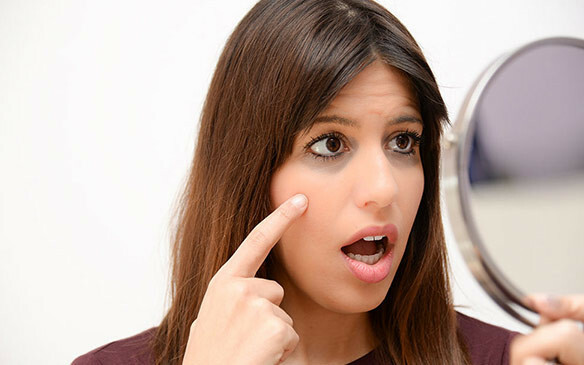 Hormonal Changes: The phases of pregnancy, post pregnancy and menstruation can cause a lot of hormonal changes within your body and leads to dark circles under the eyes. Dehydration: If you do not drink 8-10 glasses of water to keep your body hydrated within every day, chances are that you will have dark circles under your eyes. Other factors: Other factors like blocked nose, mental stress, taking multi vitamins and allergies can also cause dark circles. For dark circles, one should consult good and qualified dermatologist. Dark circles can be effectively treated at Sakhiya Skin Clinic with various techniques like Lasers, Peels, Cosmeceuticals, PRP, Botox, Dermal Fillers, etc.